A two-stroke engine has an advantage over a four-stroke in the power-making game because it has a power stroke every other stroke instead of every fourth stroke. So for any given two-stroke engine you need a four-stroke engine that is roughly double the displacement to make the same power. That means a bigger engine, which means more weight, and we all know weight is the enemy of snowmobile performance. But there is a solution: boost. 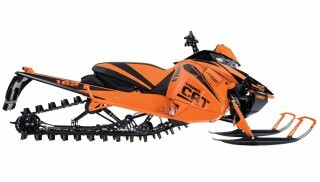 Arctic Cat was the first to stick a turbo on one of its sleds when it released the T660 four-stroke engine in 2004. Now three of the four manufacturers either sell a turbocharged sled in their showroom or offer a turbocharger kit in their parts catalog. But what is boost, why do we need it and, more importantly, how do we control it? How and Why Do We Produce Boost? To get added performance from its sedate 660cc four-stroke motor, Arctic Cat engineered a turbocharged version that offered 110 horsepower and 92 lbs-ft of torque from double-digit turbo boost, which it would warranty, but the engine manufacturer would not. Boost is produced by either a turbocharger or a supercharger. A supercharger is typically driven by a belt off the crankshaft of the engine, while a turbocharger is driven by the energy of the exhaust gases being expelled from the engine. Superchargers and turbochargers make horsepower by pressurizing the intake manifold, squeezing and forcing air into the engine thus increasing the air/fuel mixture, which allows the engine to pump more air and make more power. So, in essence, they make an engine “bigger.” While turbos and superchargers accomplish the same goal, the advantages of a turbo in a vehicle such as a snowmobile outweigh those of a supercharger. A Swiss engineer named Alfred Buchi was the first to patent a supercharger driven by exhaust gases back in 1905. Since then, turbochargers have evolved to become one of the best, most efficient ways of increasing power. They are small, easily packaged and as long as there is an exhaust charge flowing to spin them they will blow air. The main downfall of a supercharger is it is driven off the crank of the engine, so it has inherent limitations regarding packaging and it robs horsepower. Arctic Cat started the turbo push with its 2004 T660 series of models that featured a 110-horsepower, turbocharged 660cc four-stroke triple. A turbocharger is simply an air pump that is driven by the energy in the exhaust gases as they exit the engine. During the combustion process energy is split approximately three ways: some goes through the crank as power, some goes into the cooling system and some goes out the exhaust. It is the “free” energy that goes out the exhaust that is captured with the turbocharger and turned into boost. The newest breed of Cat was specifically designed to house and handle the 177 boosted horsepower of the 1100 four-stroke. Turbocharger: The correct turbo in any application will feature low system restriction, low charge temperature; low RPM boost threshold and low exhaust manifold pressure. Fuel System: A turbocharger essentially increases the size of an engine because it forces more air into the cylinder and, since an engine’s fuel system is sized to match the engine, the system must be modified to work as if it’s feeding a larger engine. 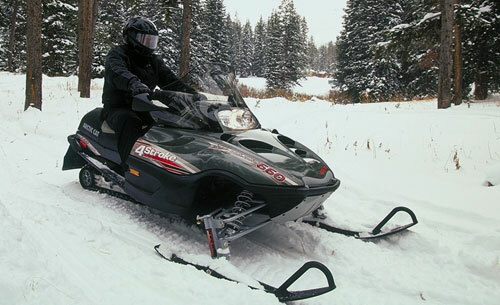 On a fuel-injected snowmobile this is often done with an aftermarket fuel controller such as those made by Boondocker or DynoJet. Boost Control: Boost pressure is typically controlled with a wastegate, which is set to release excess pressure at a specific pressure point. Uncontrolled boost can damage an engine, so the wastegate typically uses a spring-loaded valve to release excess pressure. Some systems also use a blow-off valve, which releases excess pressure that builds up in the charge tube after the throttle is closed. 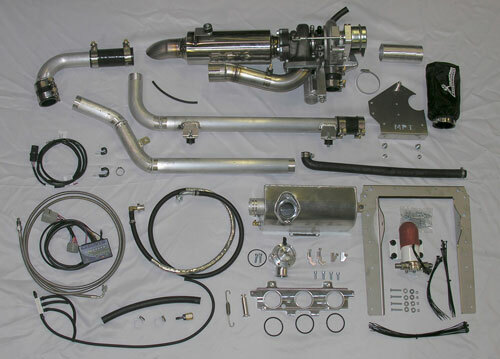 Although it looks intimidating when you lay out the components of the Mountain Performance turbo kit Yamaha’s YPAD (Yamaha Parts and Accessories Division) sells for its Nytro MTX, it’s really not. Turbo systems are surprisingly simple. Intercooler: Some turbo systems use an intercooler that is similar to a car’s radiator only it flows air instead of coolant. When air is compressed it heats up so it’s the intercooler’s job to cool the intake charge. 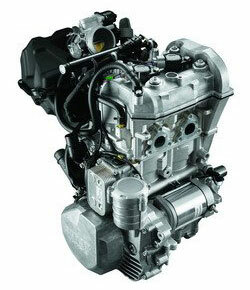 The cooled intake charge results in a denser air/fuel charge and more power. A turbocharger could turn an entry-level four-stroke engine such as Ski-Doo’s Rotax 600 ACE into a formidable powerplant. Could this be the next production boosted engine? 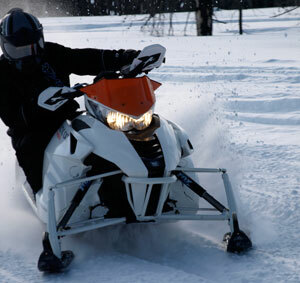 The benefits of a properly engineered turbocharger system in a snowmobile are many. Most times the rider won’t even notice the turbocharger at slower speeds or low throttle opening. And when boost comes on it is smooth and linear so, though noticeable, it is not a distracting feature. Also, a turbocharger naturally quiets the exhaust, so much so that most systems do away with the stock muffler in favor of a much smaller, freer-flowing one without substantial increases in decibel levels. A turbocharger can safely increase power levels by 30-50-percent, but power increases of 100-percent or even more are not uncommon for those who wish to go to the extreme. 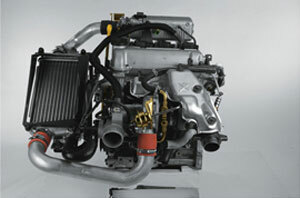 As stated earlier, a turbocharger allows an engine to pump more air so it essentially increases the size of an engine. As manufacturers develop small, lightweight four-stroke engine packages to comply with EPA regulations we may see the use of turbochargers expand as they become a tool that helps snowmobile builders make small engines perform like larger ones. Have We Seen the Future of Snowmobiles?